Neil Murray (b. 27. August 1950) shot to fame as the original bassist with Whitesnake, playing on all their albums from the 1978-beginning, right up to and including their highly successful “1987” album. He has also been a member of Gary Moore’s band (1982-3) and a member of Black Sabbath for 3 years in the late 80s and mid-90s. 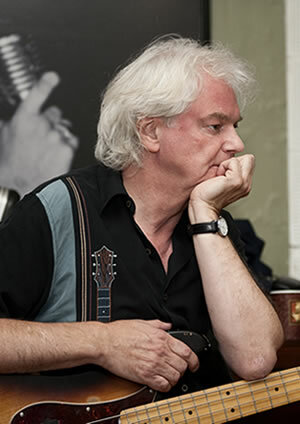 An in-demand session musician, Neil Murray is known for having worked with a long list of rock stars over the years such as Eric Clapton, Jeff Beck, Ozzy Osbourne, Sting Steve Vai, Joe Satriani, Brian May, Queen, Gary Moore, Peter Green, Paul Rodgers, Robert Palmer, Ian Gillan, John Martyn, Scorpions and Michael Schenker – to mention a few..
Today, Neil Murray is part of the band for the musical “We Will Rock You” in the West End of London, celebrating the music of Queen. He has also been known to tour regularly with his ex-Whitesnake colleagues Bernie Marsden and Micky Moody in a number of different Whitesnake-related outfits. His latest band project is Snakecharmer, an all-star lineup featuring Laurie Wisefield, ex Wishbone Ash, Harry James of Thunder, Adam Wakeman and Chris Ousey of Heartland, in addition to Whitesnake -mate Micky Moody. The Fluffy Jackets have been extremely fortunate to work with Neil Murray ever since our first EP ( “The Fluffy Jackets”, 2007). We are thrilled to have him back playing bass on our debut album – his bass lends a lovely melodic vibe to our songs.